This is the home page for my handwriting paper; however, with each of the different penmanship sets, there is usually one matching blank handwriting paper, so while this is the main page for handwriting paper, this is not all of the handwriting paper at DY. To print my handwriting paper, follow the links below or the links above that are in the bottom row in the menu. Choose the rule size, open the file, and print. Basic Usage:I do not sell this paper in printed form. [Once in a while, I am asked that question.] These files are meant to be printed from your personal printer, or from your school printer, church printer, or office printer using your ink and your paper. Terms of Usage:You may print the paper for your personal use and for your students to use. The files and the printed form of the files may not be used for any type of commercial use or placed on an intranet or network. Please do not upload my files to email, forums, blogs, or any type of web site. If you need to share or recommend my handwriting paper files, please share the URL to this web page or to one of the pages below. Color offers printables that print in color. The files print a medium tone, so pencil should show up well on these handwriting papers. 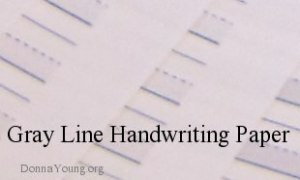 Yellow Line Printable Handwriting Paper features a yellow lower rule. The rule outlines are cyan, a blue-green color. The printable papers are available in bot fully ruled and blank top as well as a range of sizes, including two tall rule sizes. The page labeled black and white is the one with the all of my older files and there is one color file on that page. I left it there so those who use that particular file can find it. The Black and White page offers horizontal, vertical handwriting paper as well as paper with no bottom space. This paper features a rule consisting of Double Lines, two lines instead of the typical 3 lines. Gray Line is a large set of printable handwriting paper and includes both fully ruled and blank-top story paper. Additionally, it is one of the few sets that offers the "tall" rule. This paper is suitable for the middle grades or so. The rule is 5/16 of an inch. Currently there is a treasure map, and a couple of open-top curved rule printable papers on this page.